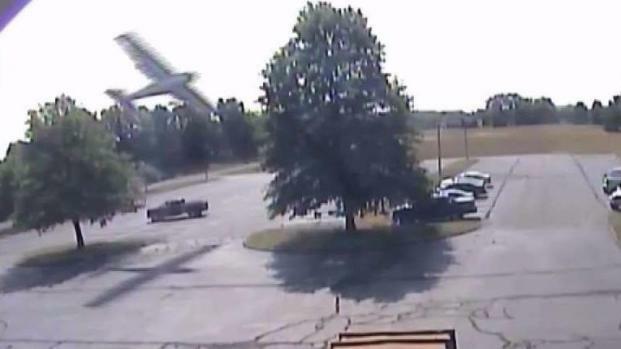 A small plane crashed in a parking lot near the Roberston Field Airport in Plainville, Connecticut, on Monday morning, and the pilot managed to walk away from the incident, which was caught on camera. Police said officers discovered a 1981 Cessna 172 had crashed behind a business, Carling Switch, that is adjacent to the airport at 11:24 a.m. The pilot, Manfred Forst, 79, was taken to the Hospital of Central Connecticut with minor injuries, Plainville police said. Forst, who is originally from Germany, told NBC Connecticut he was going to breakfast when the plane crashed. A 79-year-old pilot was not seriously injured after his plane crashed into a tree in a parking lot near Robertson Field in Plainville on Monday. "I was very fortunate I got out of it without any real injuries," Forst told NBC Connecticut. "I'm just so thankful." Forst said he gave his wife a big kiss when he got home after the crash. The Federal Aviation Administration responded and is investigating the crash. There was a minor fuel leak.